Chef Gary became interested in cooking at very young age. His first cooking instructor was his Mother who held cooking classes 3 times a day, every day, as her children watched her make their breakfast, lunch & dinner. Chef Gary’s second cooking class was taught by the world’s greatest Grill Master, “Chef Dad”. Chef Gary’s Dad’s classes were held mainly on the weekends and started the minute the BBQ was fired up. One of Chef Gary’s favorite TV shows growing up was the Galloping Gourmet with Chef Graham Kerr; man could the guy slice an onion or what? Chef Gary’s love of cooking continued into high school as he became the first male student to take High School’s Cooking class; the 1970 version of today’s Food & Nutrition classes. Chef Gary created Phil’s Catering Service in 1986 as a means to make a few extra dollars on the weekends.14 short years later his catering started to grow at a surprising rate. As his business grew, he was able to hire culinary trained Chefs to help him in the kitchen and intern my cooking classes to this very day. Central Coast catering for over 30 years. 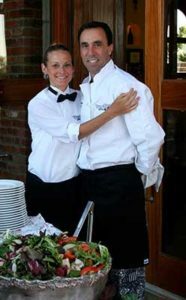 Phil's Catering Service is the oldest and largest catering company on the Central Coast of California. Phil's Catering was awarded #1 caterer from San Luis Obispo Wedding Faire in 2000, 2014, 2015 and 2016.